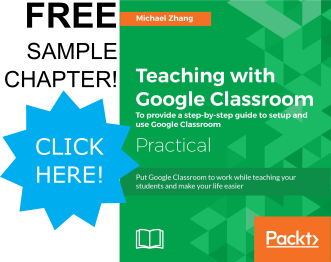 Whether your company moved from Microsoft Outlook to Google Apps or you are using Gmail and wanting to use it more efficiently, here are ten features to help improve productivity and become a Google Gmail poweruser. 10 Create rules for Incoming Emails with Filters. Too many icons can be difficult to navigate through Gmail. 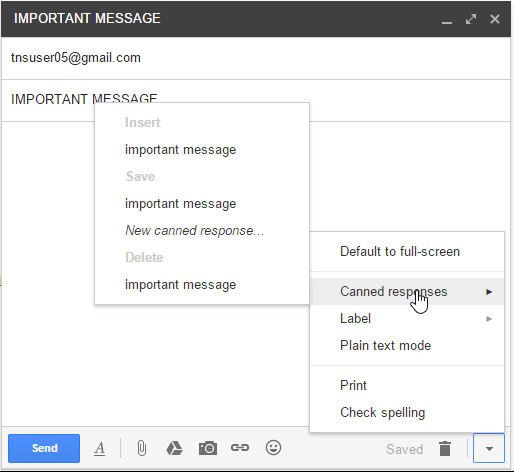 However, we can change many of the icons found in Gmail into text.
) and click on “Settings”. Scroll down to “Button Labels” and select the “Text” radio button. Scroll to the bottom of the screen and click the “Save Changes” button. Drag the label from the left sidebar onto the email. Check the check boxes in the “Add Label” icon in an email or while the email is selected in the message list. In the email, click on the “Archive” button in the buttons above the email. In the inbox, check the check box of the email and click the “Archive” button in the buttons above the message list. Your inbox may be constantly filled with confirmation or update emails where all the information is found within the subject or first line of text in the email. If so, the “Mark as Read” button can save clicks to marking an email as read in your message list and immediately labeling and /or archiving the email.
) and lick on “Settings”. Click on the “Labs” tab and scroll down to the “Mark as Read button” feature. Click on the “Enable” radio button, scroll down to the bottom of the page and click the “Save Changes” button. Now, when an email is checked in the message list, a “Mark as Read” button will appear beside the trash button.
) and click on “Settings”. Scroll down to “Stars” and click and drag desired stars from the “not in use” row to the “in use” row. Rearrange the order of the stars if desired. Stars will appear in order from left to right. Scroll down to the bottom of the screen and click the “Save Changes” button. Click on the star icon in the message list or in the email continually to cycle through enable stars.
) and click on “Settings”. Click on the “Labs” tab and scroll down to the “Undo Send” feature. Click on the “Enable” radio button, scroll down to the bottom of the page and click the “Save Changes” button. When sending a message, a link will be visible in the yellow status bar immediately after the message is sent. Email locations such as “All Mail” and “Trash” are hidden by default. If these are locations that you reference frequently, keep them visible in the label sidebar.
) and click on “Settings”. Click on the “Labels” tab and scroll down to the desired system labels. 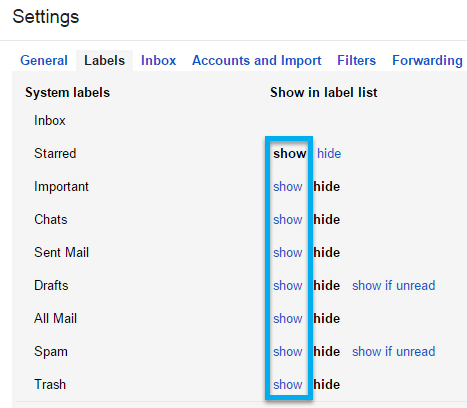 Click on “Show” beside any system labels that you want to remain visible. NOTE: You can do this with user created labels as well.
) and click on “Settings”. Click on the “Labs” tab and scroll down to the “Preview Pane” feature. Click on the “Enable” radio button, scroll down to the bottom of the page and click the “Save Changes” button. To activate Preview Pane, a new icon will appear on the right side of the Inbox button menu (near the Settings gear). Clicking on the drop-down arrow will give you options for a “Vertical split” (like Outlook), a “Horizontal split” (like Thunderbird) or “no split”, which disables preview pane. To find a comprehensive list of all advanced search operators, check out Google’s Help page. Create rules for Incoming Emails with Filters. 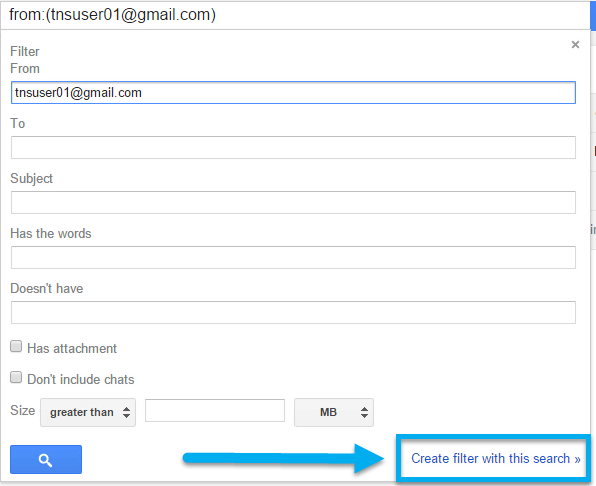 Filters allows Gmail to perform certain actions to incoming emails that match a specific search criteria. For example, if you always label an email from a person as “Important,” a filter will automatically label all future emails received from that person with the “Important” label. Creating a filter begins with an advanced search or by clicking the drop down menu of an email. Add any additional search parameter and then click the “Create filter with this search” link. 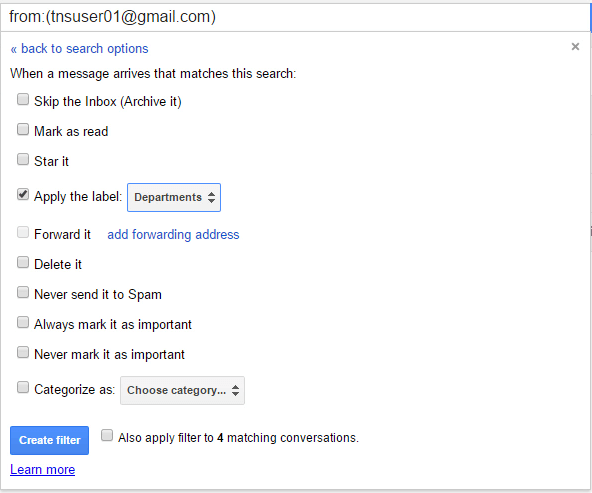 Choose actions to perform to incoming emails matching the search and then click the “Create filter” button. If you tend to write similar email frequently (for example, a confirmation email), using canned responses allows you to save pre-written messages to be quickly inserted into new messages. This feature is very similar to “Quick Parts” in Microsoft Outlook.
) and click on “Settings”. Click on the “Labs” tab and scroll down to the “Canned Responses” feature. Click on the “Enable” radio button, scroll down to the bottom of the page and click the “Save Changes” button. Canned responses must first be created in the email message. Once the canned response is created. 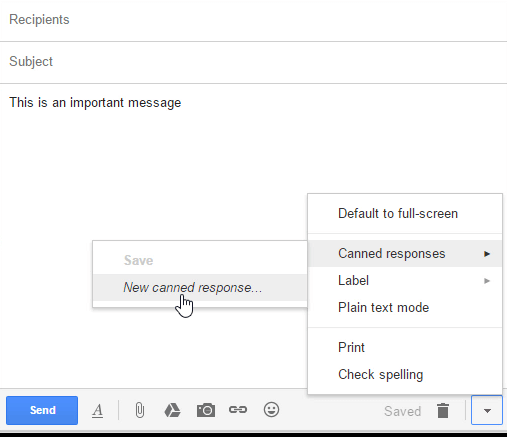 Click the drop down menu in the new message, mouse over “Canned Responses” and click “new canned response.” After naming the canned response, it will be available in the same menu for future messages. Much like any skill, increasing productivity with Google Gmail is not an overnight endeavor. Furthermore, each situation is different. By no means should you try to incorporate all ten (not even more than 6 or 7) immediately into your daily Gmail work environment. As your become comfortable with and incorporate more features into your daily workflow, the productivity will improve. Just remember, with all change, take things one step at a time!